This bride wore the most offbeat outfits for her wedding and it's absolutely drool-worthy! Time and again I come across some brides that really do leave me mesmerized. One such bride is Divya who planned her dream wedding with offbeat fairy-tale themes for all her pre-wedding ceremonies. What caught my attention the most was her choice of lehengas and the best part - she had styled all her bridal looks herself *woah*! Her engagement’s theme was inspired by the Sakura (Japanese) which is a Cherry Blossom season in Japan. For this, Divya chose to wear a heavily embellished baby pink lehenga skirt paired with an off-shoulder crop top with a sweetheart neckline. She completed the look with statement choker and earrings from Khanna jewellers skj, radiant makeup and a stunning shade of pink on the lips. They make a stunning pair, don't they? And with her dog BFF. Who is twinning with her! Does it get any cuter than this? Divya had a pastel-pop themed mehendi and her outfit choice for this event was another stunner. She chose to wear a lilac Papa Don’t Preach embellished tulle lehenga paired with a glass beaded cut work choli and looked stunning. She completed the look with matching jhumkas, a statement matha-patti and a bracelet. Her matha patti from Hazoorilal Jewellers, was something that had all eyes on her though. She balanced her no necklace look with her with it and I simply adore her offbeat choice of jewellery! For this look, she kept the makeup prominent with pink eyeshadow and outlined it with a dash of purple, her highlighter on fleek and a pop-of-pink on the lips. This one is giving me some major #UnicornVibes too! I literally can’t get over that purple crosia outfit of her pup! Just look at that twirl! For her sangeet, she chose to wear the bollywood's favourite designer - Manish Malhotra. She wore a powder blue high-waist heavily embellished lehenga skirt with a sheer overlay paired with a equally embellished 3/4th sleeve choli with a sheer-neckline giving it a off-shoulder effect. She completed the look with a shimmery net dupatta, blue gemstones necklace-earring set and bracelets. For taking her pheras, she took the traditional route wearing a voluminous all-red sabyasachi lehenga. The lehenga comprised of a ball-gown lehenga skirt with golden placed motifs on it, a deep sweetheart neckline choli and double dupattas. She completed the look with a statement matha-patti, a heavy gold choker-earring set with emerald bring the pop-of-colour to the look and a floral bun. 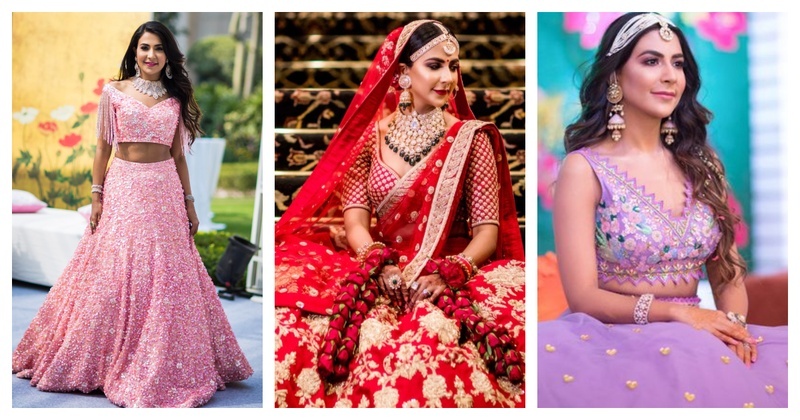 Well keeping up with Divya’s wedding wardrobe has given me some serious #BridalOutfitGoals and I hope it solves your ‘what to wear to which event’ queries too!